Online jewelry retailer, BillytheTree.com is excited to announce the addition of a full line of Seiko watches to their collection, consisting of over 300 styles. BillytheTree is proud to be a new reseller of a full line of Seiko watches. Online jewelry retailer, BillytheTree is proud to be a new reseller of a full line of Seiko watches. The new collection, consisting of over 300 trendy and classic Seiko styles, was recently brought on to BillytheTree’s expansive watch assortment. Seiko is one of the most recognized watch brands in the world, and has not only a devoted following of collectors, but is also very popular among the general public and well-known for its quality, reliability, and style. With price ranges of styles as low as $80 to over $300, the new collection provides a diverse assortment of leather and stainless steel straps, black, silver and gold materials, and chronograph, solar, and automatic dial movements. With what started with the Seikosha factory, the company has become one of the most innovative and ground-breaking watch companies of all time. To date, Seiko bears in mind the founder, Mr. Hattori's vision: the pursuit of perfection. BillytheTree has meticulously catalogued Seiko’s line, allowing customers to very quickly narrow their search by a large variety of characteristics, such as watch movement, watch strap material, watch dial color, and the shape of the face. Since BillytheTree is an authorized dealer, any Seiko watch purchase is fully backed by the manufacturer’s warranty and guarantees a peace of mind that every watch is 100% authentic. 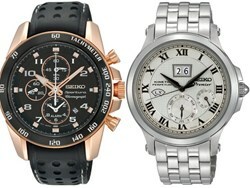 For more information or to purchase a Seiko watch, visit http://www.billythetree.com/seiko-watches.aspx. Founded in 2004 by Robin Weber when he was still a senior in high school, BillyTheTree.com offers a large variety of affordable, yet high quality jewelry, watches and sunglasses. The company offers free worldwide shipping on these product lines, which include over 20,000 items, consisting of magnetic jewelry, sterling silver jewelry, gold jewelry, diamond jewelry, jade jewelry, high performance sport sunglasses, Seiko watches, and more. For more information, or to place an order, please visit: billythetree.com.